For this exercise there were 2 parts. The first required us to explore a street that is well known to us, I chose the street I live on, and take a series of photographs of it, thinking of new ways, angles etc to shot from and practising observation skills that we will need for Assignment 2. Once we had done this we had to review and comment of the photos. Overall, I found the exercise quite challagning. When I first started, I found to hard to think about what could make interesting photos but then I decided to just go out and take a few at a time using my iPhone. By leaving it a few hours or a day inbetween every 3/4 images, I found I was able to start afresh and get a different image each time. There are of course some images that I was less happy with then others such as the wooden fence and the grass and the one of the the roof top with the blossom tree in the background. 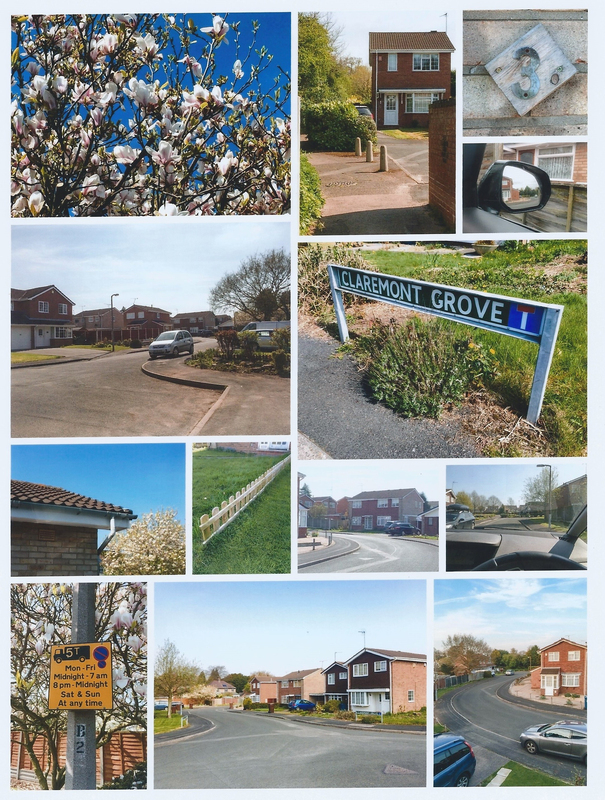 However, I was really pleased with the the images of the street from the first floor window (bottom right), the image of the house from the alleyway and the close up of the road name. For the second part for the second part of the exercise, I chose to watch and review “Little Miss Sunshine”. I initially wanted to watch and review “Fear and Loathing in Las Vegas”, however I found it very hard to understand as it moved too quickly. “Little Miss Sunshine” was released in 2006. It is about a girl, Olive, who is called to complete in a beauty contest after another contestant is disqualified. The only problem is that the contest is being held in California, 800 miles away. Due to financial problems and other logistical problems (her uncle has to be constantly watched after a failed suicide attempt), the whole family end up making the trip in a Volkswagen T2 Microbus. The bus itself is questionable and not long after they start the journey, the clutch breaks so the only way they can make it work is to push it until it reaches 20mph and all jump in. In the beginning of the film, we are shown small insights into each character. The father who is a motivational speaker and life coach obsessed with winning, the hard working mother, the foul mouthed Grandfather, the miserable teenage son and the scholar uncle. The film is all about chasing the “American Dream”. The majority of the movie is played out on the road. Along the way the family fall apart, make amends and learn new things about themselves and their other family members. The director chose the particular vehicle as it allowed the camera men to film the characters from various angles, most of which also help to frame the surroundings. The surroundings are beautiful and picturesque, a quintessential American landscape. The sun is always shinning on their way there and the viewer feels as though they are going along for the ride to. The problems they have with the bus are representative of the family. Old, run down, falling apart but just about working. When they arrive at their destination, they can see it however it still isn’t quite within reach. They finally arrive and almost aren’t registered for the contest as they arrived 4 minutes late, however this is soon cleared up and Olive gets her big chance. It soon becomes clear to her family that she is not in the same league as the other contestants. Although her family try to stop her for entering the talent portion, Olive goes ahead. Sadly for Olive for “dance routine” is not well received and the family end up in a police station an asked never to enter Olive into any other contests in California. The family agrees and sets off home. The film ends with the family driving off in their microbus into the sunset forever changed, for the better, and possibly realising that the grass isn’t always greener and that you don’t have to have a picture perfect life to be happy. This entry was posted in Landscapes, Photography and tagged explore a road, landscape, Little Miss Sunshine, movie review, OCA Landscape, OCA Landscape Part 2, review, Road movies, Road trips, streets. Bookmark the permalink.